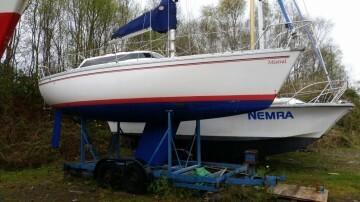 The boat was built in 1984 and first in commission in 1985 with only four owners from new when imported in Glasgow. She had very little use during the first 10 years and spent three years ashore. She has since been used as a coastal, family cruiser along the west coast of Scotland. The boat has been lightly used throughout her life. Aft double berth cabin, two single berths in open plan cabin with double vee berth forward. Separate heads aft with wash hand basin. Taylor twin burner paraffin stove (newly installed 2010). Cool box and single sink. New in 2008. Main with packaway system and jib with UV strip. Good condition. NASA twin speed depth/log and GPS repeater in cockpit. Silva DSC VHF radio. Plastimo cockpit bulkhead compass. Twin battery (12v house and engine) with charge regulator, shore power connector and charger. Single 240v socket from inverter. Shore power. Optional equipment subject to negotiation - tender, outboard, life jackets, sat nav and handheld radio. Max. cruising speed: 8 kts approx.